You’ve finally found a bread low in carbs and you’re not sure how to make it or whether you’ve got all the ingredients. 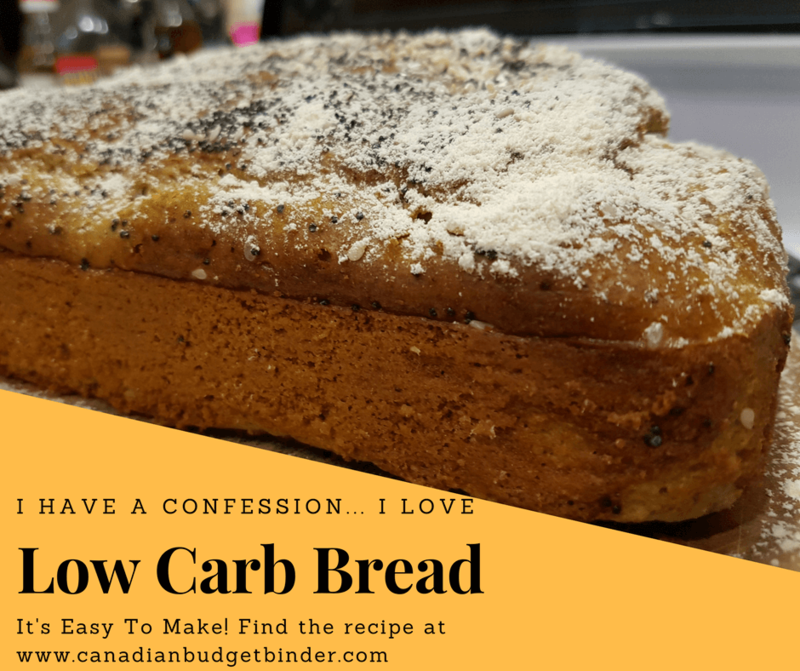 I know it can happen but it won’t with this simple no-knead, low carb bread recipe that I’m SO excited to share with everyone. 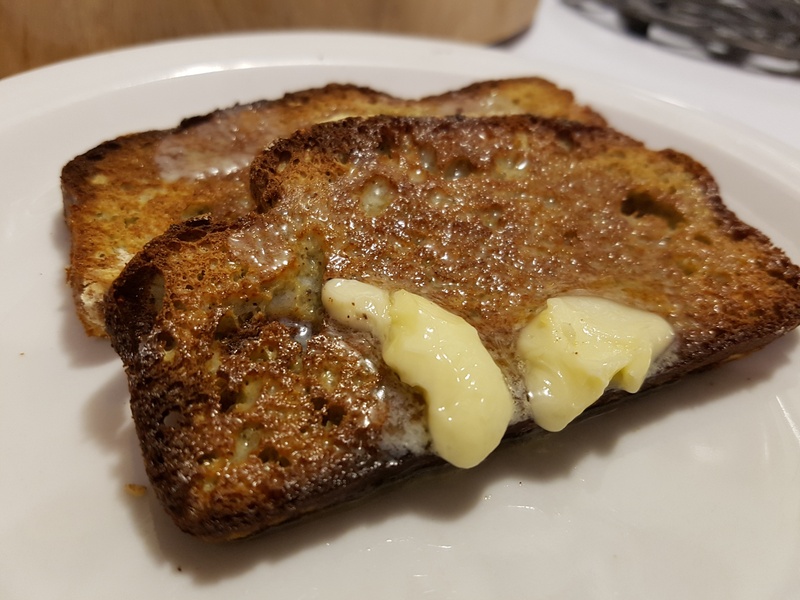 Get ready to watch the butter drip from thin slices of this low carb bread toasted to perfection. 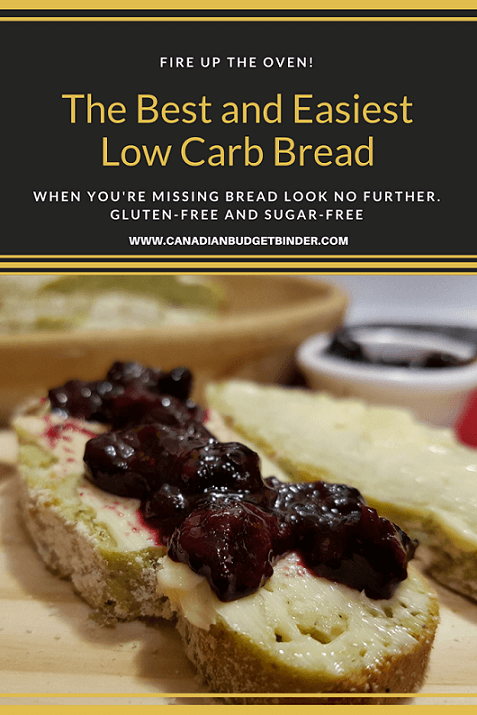 We refuse to pay huge amounts of money to have low carb breads delivered via online grocery shopping from a specialty website in Canada, so we made our own for far less. 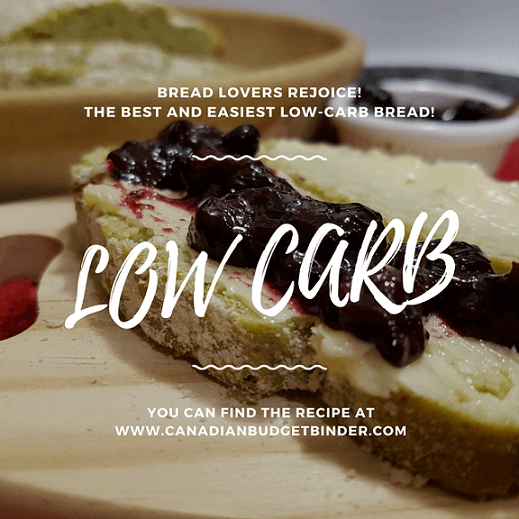 Rejoice bread lovers and set aside those lettuce leaves you’ve used as low carb bread alternatives and get ready to indulge your tummy with crispy toast and butter, sandwiches of all types and even chunky croutons! I know it sounds daft but Mrs. CBB and I have created loaves of this low carb bread for about 3 weeks now. Although we suffered and had some fails where the bread tasted like egg or was heavy as a rock we didn’t give up trying. Ta-Da it was heaven when we sunk or teeth into a recipe that we could finally add to our low carb recipe box. We’ve finally come to the conclusion that you can make our low carb bread any flavour you want or add any toppings you fancy without harming the bread. 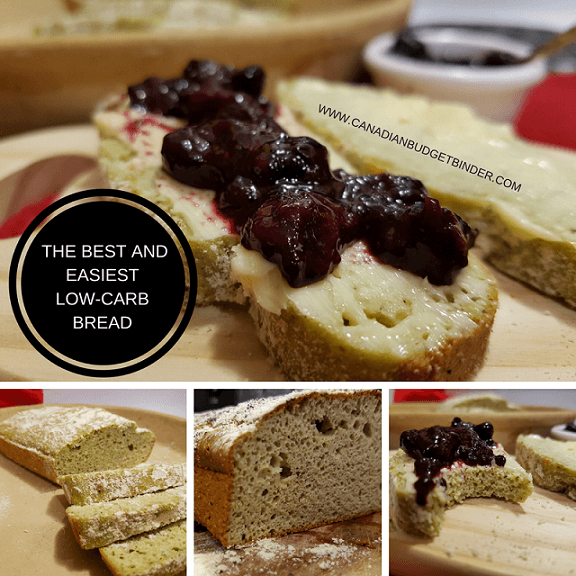 So far we’ve made low carb sesame seed bread, low carb poppy-seed bread, ordinary white low carb bread and a low carb almond flour bread although we found that to be to heavy but still delicious. We’ve also added crushed flax-seed for extra fiber and wheatgrass. You can grow wheatgrass at home however we went ahead and bought a bag in the UK for about $6 Canadian. 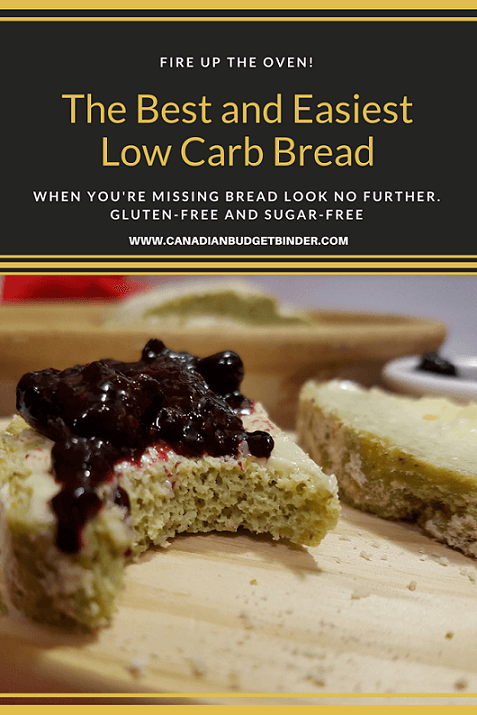 If you’re not a fan of wheatgrass or flax-seed don’t worry as they are only add-on’s for this low carb bread recipe. That means you can add it or leave it out and you’ll still end up with the best keto bread around. 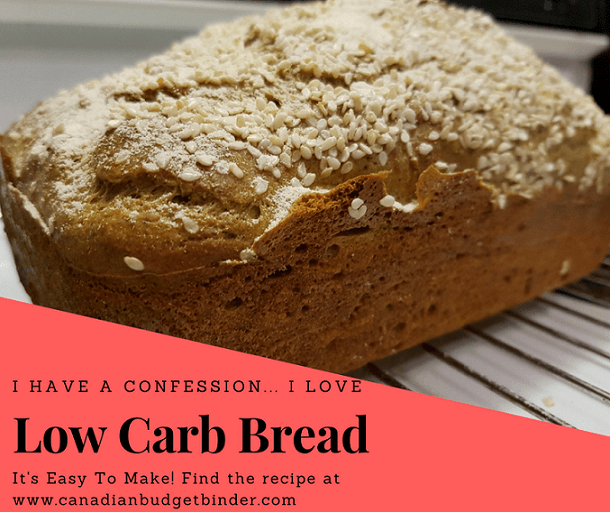 Low carb bread options can be far and few when you enjoy a keto lifestyle so the best way to get it, is to make it yourself. While you build a pantry for your low carb shop at home it’s important to write all the critical low carb ingredients that you will need. This helps because you force yourself to bake at home instead of reaching out for something naughty like regular bread. 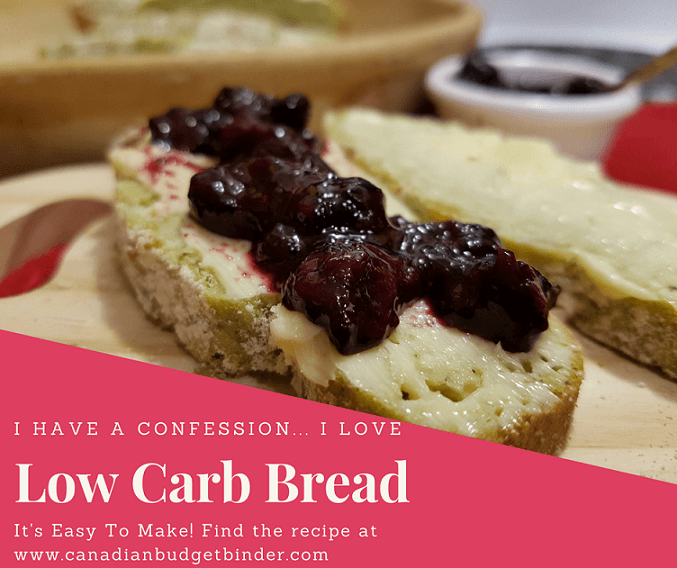 Besides eggs and cream cheese there are three essential ingredients for this low carb bread recipe-psyllium husk powder (Bulk Barn), pure iso-whey protein powder (unflavoured low-carb) which we bought at Zehrs. It is the President’s Choice brand which costs just under $30.00 for a large container. The last critical ingredient is apple cider vinegar. We bought a jug at Costco a while back for under $8 and it’s an organic apple-cider vinegar which we use quite a bit in low carb cooking and baking. The reason we add apple cider vinegar to our bread recipe is to help keep it light in texture as there is no kneading in the process and to help break down the dietary fibers and aids as a leavener to the baking powder. If you can’t find a psyllium husk powder you will have to grind what you buy at home. This is what we do and trust me when I say we use our thrift-store $5 coffee grinder quite a bit in low carb cooking. I’d suggest investing in one if you’re serious about choosing low carb, paleo or keto lifestyles. No wand required just a few ingredients, bread pan and an oven which you can pre-heat right now to 325 degrees and butter a loaf pan generously. A standard loaf pan requires you to double this recipe for optimal bread height unless you don’t mind a smaller loaf of bread. The smaller bread is great for toast or even French Toast but a bit small for a good-sized sandwich. I bought an oblong baking pan at Value Village last week and we doubled the recipe but it certainly could have benefited from a triple batch of the bread mix. 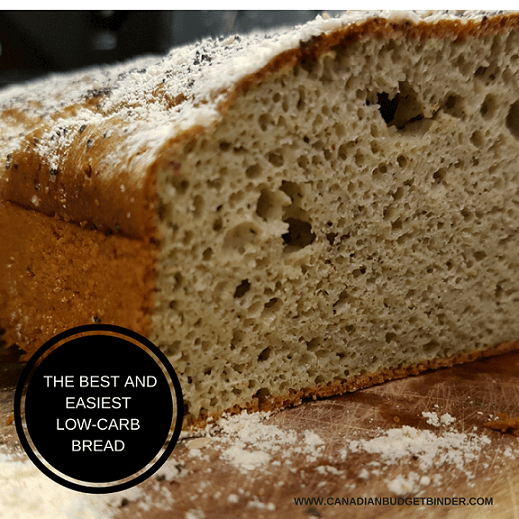 Overall, our best loaf of low carb bread was our low carb sesame seed bread in a standard sized loaf pan 8.5×4.5×2.5 where we doubled the recipe. If you’re not a fan of the seeds on top leave them out. I suggest that you take a knife and make a slice down the middle to help the bread when it rises. It also makes the bread look authentic and release steam to help it rise. Bake for approximately 35-40 minutes or until the bread looks golden on the top. Cool on a wire rack for 5-10 minutes then pop it out of the tin to cool further. Dust the low carb bread with almond or coconut flour on top once it’s cooled for that bakery bread effect and texture. You’ll love it. 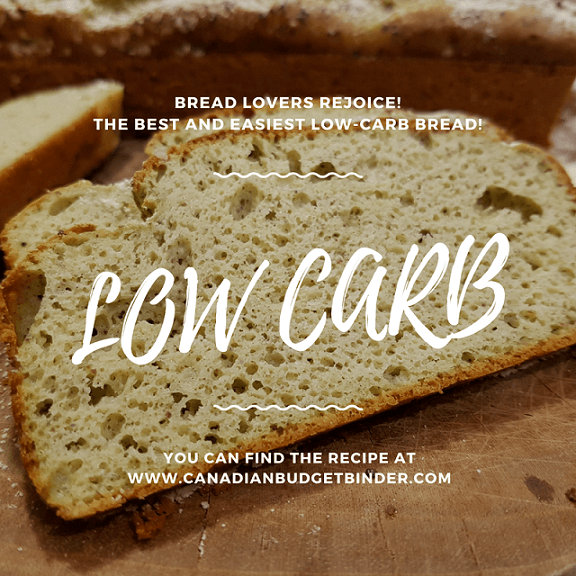 That’s how easy it is to make a low carb bread at home and the best part is you can add flavours as you go along without hurting the recipe. 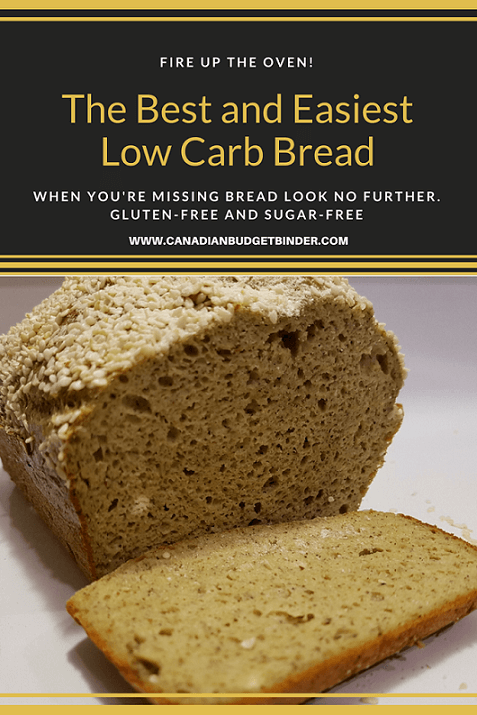 You don't have to live without bread when you are enjoying a low carb diet any longer. 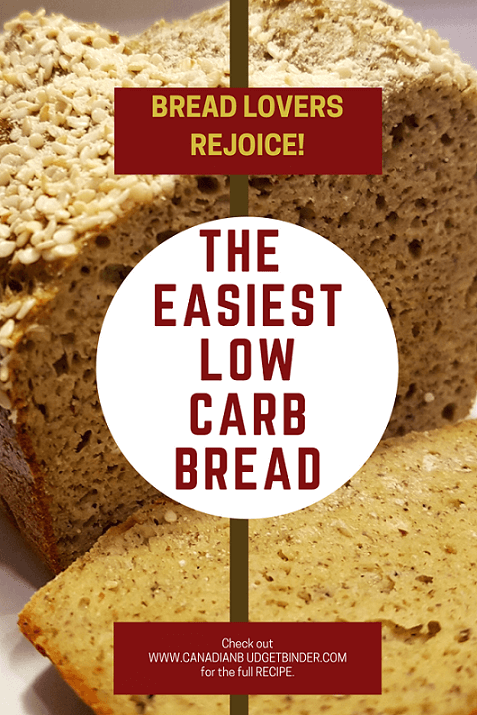 This low carb bread will be one staple that you WILL make week after week. We have, enjoy. This makes one small loaf of low carb bread. Double for a large, full loaf. NOTE: You must double the recipe for a standard loaf pan if you want a higher loaf. Triple it if you use a bigger loaf pan. If you want a smaller loaf use the recipe above in a standard loaf pan or smaller. In a large bowl with your hand-mixer beat the cream cheese until smooth then dump in the eggs and blend them in. Add your salt, baking powder, protein powder, psyillium husk powder, apple cider vinegar and whipping cream. If you plan to use wheatgrass or flax seed powder as an option add it in now. Pour into loaf pan and using a knife make a slit down the middle of the loaf. If you want to add sesame seeds or poppy seeds now is the time to do so. If you’re a huge fan out croutons one tip I will share is when you fry up bacon chop the low carb bread into thick chunks (the size of croutons) and fry them in the fat. O.M.G they are delicious. Low carb bacon croutons are something you won’t want to miss on your salads. Another tip is to slice the bread thin without breaking it when you want toast or making grilled cheese. The reason for this is so the bread gets crispy otherwise the inside will be soft and the outside crispy. The choice is up to you but it’s good either way. Discussion Question: What types of low carb breads have you made in the past? What did you like or dislike about them? Per entire Recipe: 10 g Net Carbs Using Atkins Net Carb Counter This will change depending on how thick the slices are. I typically can get 20 slices each loaf but they are medium to thin slices. Each slice 1.0g net grams. 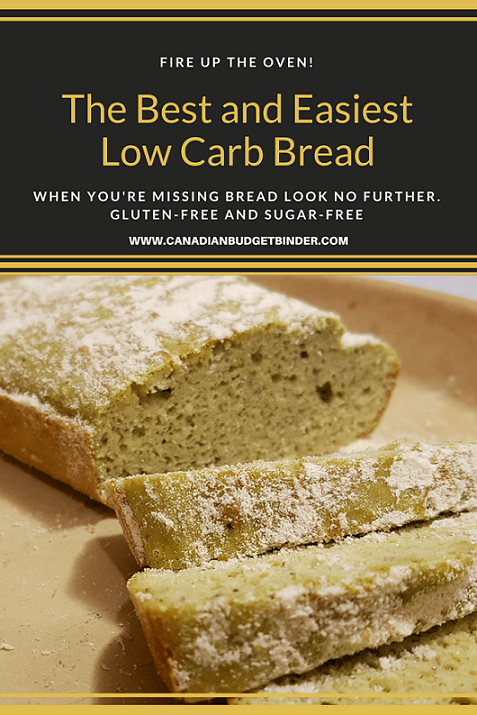 Thanks for sharing this low carb bread recipe. I’m thinking to add chia seeds for more health benefits and added flavor. Ive seen in a few low carb bread recipes where they seperate the eggs and beat the egg whites till foamy to further help the bread rise. Hats you’re thought on this? Very good! I made a silly mistake that actually turned out ok as I bought orange flavoured Psyillium in error and didn’t realize until the batter turned orange lol! Tastes pretty good though ;). Hahaha, I had no idea they had orange flavoured to be honest. I guess it would make great toast or french toast. Thanks for the feedback. Can this be done in a bread maker. I’ve never tried it in a bread maker but it’s worth a shot. If you do come back and let us know for others who might be interested. 🙂 Take a photo too so we can share it with the readers. Glad you shared this recipe. I was searching for one to bake healthy and nutritious bread at home.